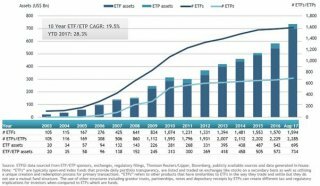 ETFGI, a leading independent research and consultancy firm on trends in the global ETF/ETP ecosystem, reported today that assets invested in ETFs/ETPs listed in Europe have increased 28.3% in the first 8 months of the year to reach a new record of US$734 billion at the end of August, according to ETFGI’s August 2017 preliminary European ETF and ETP industry insights report, an annual paid for research subscription service. 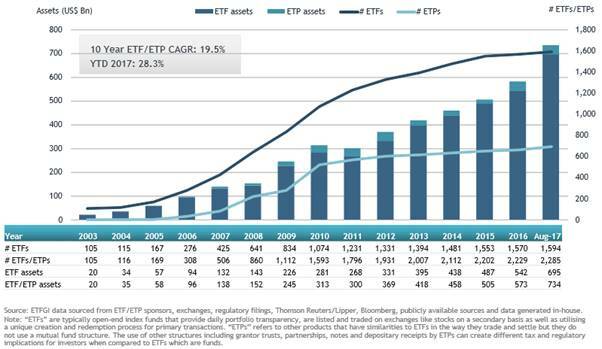 The European ETF/ETP industry had 2,285 ETFs/ETPs, with 7,215 listings, assets of US$734 Bn, from 60 providers on 27 exchanges in 21 countries. ETFs and ETPs listed in Europe gathered US$4.25 Bn in net inflows in August marking 35 consecutive months of net inflows and a record level of US$78.26 Bn in year to date net inflows which is more than the US$39.90 Bn in net inflows at this point last year and US$22.57 Bn more than the US$55.69 Bn net inflows gathered in all 2016. “August is typically a challenging month for equity markets with the average loss over the past 20 years for the S+P 500 at 1.3%. This year the S+P 500 was up 0.31% in August and 11.93% year to date, MSCI ACW was up 0.44% and 15.48% YTD while MSCI EM was up 2.27% for August and 28.59% YTD (all prices in USD). Storms and political risks remain a focus for investors - the ability of the Trump administration to move forward on policy goals and hearings on Capitol Hill, Brexit negotiations, and North Korea is still an area of concern.” According to Deborah Fuhr, managing partner at ETFGI. Equity ETFs/ETPs gathered a level of US$1.63 Bn in net inflows in August, bringing year to date net inflows to a record level of US$44.73 Bn, which is much greater than the net inflows of US$875 Mn over the same period last year and more than the US$17.98 Bn gathered in all 2016. Fixed income ETFs and ETPs have gathered a level of US$2.32 Bn in net inflows in August, growing year to date net inflows to a level of US$22.12 Bn, which is less than the same period last year which saw net inflows of US$25.64 Bn. Commodity ETFs/ETPs saw net outflows of US$108 Mn in August. Year to date, net inflows are at US$7.65 Bn, which is significantly less than the net inflows of US$11.46 Bn gathered over the same period last year. iShares gathered the largest net ETF/ETP inflows in August with US$2.55 Bn, followed by Vanguard with US$487 Mn and SPDR ETFs with US$437 Mn net inflows. YTD, iShares gathered the largest net ETF/ETP inflows with US$26.62 Bn, followed by UBS ETFs with US$9.61 Bn and Lyxor AM with US$8.78 Bn net inflows.